Thank you to our corporate sponsors of the pancake breakfast. Their funding and donations allow the Board of Trade to continue to provide services to the community. The taps are running and Maple Tap Farm is holding it’s annual open house on Saturday March 23 (10-4) and Sunday March 24 (12-4). Come out and watch the syrup boil, and enjoy a sample! Just north of New Dundee on Queen Street. 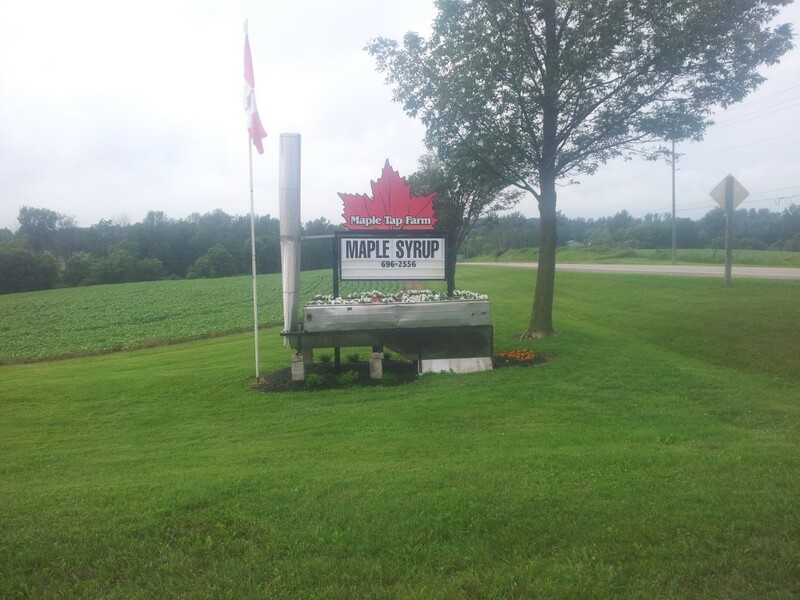 Maple Tap Farm is 2 time winner of Elmira Maple Syrup Festival. Pancake Breakfast – more people, less waste! The Board of Trade’s pancake breakfast was once again a huge success. We had approx 300 people enjoy pancakes and good company. Attendance is up substantially over last year. And in more good news, we are generating less trash than every before. The only garbage generated were about 6 plastic bags from the sausages, and about 6 plastic bags from the apple sauce cups – about a handful of garbage in total. That’s amazing for 300 people! Author Glenn CookePosted on March 18, 2019 Leave a comment on Pancake Breakfast – more people, less waste! Bethel Church (1531 Bridge Street, New Dundee) is hosting a Family Game Night on Friday March 15th starting at 6:30PM. Loads of Fun with Group Games, Popcorn, Snacks, Drinks and a Candy Scramble. There is no admission fee but there will be a donation basket for those who would like to help with the evening’s expenses. Children must be accompanied by an adult. If you have questions, please contact the church office (519-696-2284). Last night the 100 Men of Wilmot Who Give a Damn had their inaugural meeting at Puddicombe House in New Hamburg. As of the meeting, membership stood at 122 men. Presentations were provided by Interfaith Counselling Centre, The Community Players, and Wilmot Family Resource Center. Attending members voted and selected Interfaith Counselling Center as the recipient of the $12,200 contribured by members. If you’d like further information about the organization, you can contact Mark Murray at 100menofwilmot@gmail.com. Wilmot has been home to a similar organization for women for a number of years, you can Read about the 100 women who care (Wilmot) by clicking here. The Township and the GRCA is holding an open house and information session to educate residents who live in flood prone areas. Learn how to prepare for flooding, hear about the flood warning system, and gather info on strategies to use during and following a flood. You will also have opportunity to query experts. Where: New Hamburg Community Center (251 Jacob Street, New Hamburg). The annual Pancake Breakfast will be held on Sunday March 17, 2019 from 10am to 1pm, at the community center. Come out and enjoy all you can eat pancakes, eggs, and sausage all topped with real local maple syrup. Still only $10 for all you can eat (children under 5 are free). This annual community event is organized by volunteers from the New Dundee Board of Trade. Wilmot Thunder is holding their information and indoor skills night on Friday March 1. Location is Bethel Missionary Church Gym (New Dundee). Come find out about the exciting 2019 softball season in Wilmot, and practice some skills in the gym. Please RSVP to newdundeeball@gmail.com to ensure that there’s enough equipment available. At the January meeting of the New Dundee Board of Trade, Community Care Concepts were our guest speakers. Community Care Concepts is a non-profit, primarily government funded agency who’s purpose is to help seniors and adults with disabilities to live independently in their own home. Their catchement area are the townships of Woolwich, Wellesley, and Wilmot. Homemaking (assistance with light household tasks including cleaning and meals). Friendly visitors and lunch dates. Support to transition from hospital to home. or visit their website at www.communitycareconcepts.ca.